This article is part of the Board Game Article series. Let's say that you're me. A frightening proposition, but it just happened. You're me. Too late to turn back now. A battered copy of HeroQuest was the crown jewel of your closet shelf throughout childhood. You enjoyed Total War: Warhammer, Dawn of War 2, and other video games with "war" in their titles. Dan Abnett's Eisenhorn omnibus was your most pleasantly surprising random book purchase. You're vaguely aware that Warcraft and Starcraft are Games Workshop's fantasy and sci-fi settings with the serial numbers barely filed off. In all these ways you appreciate Warhammer from a safe distance. Yet for some reason you've never quite taken the plunge and tried a miniatures wargame. Warhammer Underworlds: Shadespire is the ideal way to dip your toe in the water. Swimming. Metaphors. It's easy to learn. Games only take around a half an hour. You get a bunch of fantastic miniatures that snap together without the need for glue or paint. There's even a nice book with LORE about realms and skeletons which you crave, because you are me. Here's the best part: While you absolutely can use the included miniatures to build an army in the larger Age of Sigmar wargame (which I'll come back to later), this is a self-contained game that stands on its own merits. Warhammer Underworlds: Shadespire is a strategic skirmish game with deck building. In short: You and an opponent (or two or three) choose a warband of fighters represented by preposterously detailed miniatures, move them around on a semi-randomized game board (with hexes! ), play cards to impact the action in countless ways, and roll dice at one another violently. There's a lot to sink your teeth into. Thankfully, the box includes a friendly quick start sheet that takes you step-by-step through a stripped-down version of the game. After five minutes you'll be familiar with the core mechanics and ready for the advanced rules. In fact, the entire presentation is top-notch. Digging into Warhammer Underworlds feels like opening an upper tier Fantasy Flight Games product. Packaging and components might seem trivial, but I find that games are more absorbing when even their smallest elements feel like extensions of their themes. Speaking of first impressions and strained transitions, let's meet the warbands vying for your affection. Garrek's Reavers - These guys love skulls and yelling, which is fantastic. However, they also love topknots, which makes them my sworn enemies forever. Steelheart Champions - They're enormous. They're noble. They're shining suits of armor containing the reforged souls of heroes who lose a little more of their humanity every time they fall in battle. Nothing creepy about them at all! Those are the fighters that come in the core set. If you decide to mix things up, Games Workshop is releasing waves of additional warbands. Each expansion includes a gang of murderous buttheads along with a slew of cards that expand your strategic repertoire. Ironskull's Boyz - Gleefully violent idiots clad in partially digested Tonka armor. In other words, the greatest faction ever conceived. 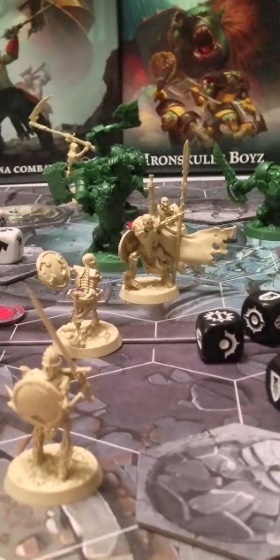 Sepulchral Guard - Skeletons. Skeletons! Seven skeletons! Skeletoooooons! SKELETONS! Skeletons. So what's the game like? Each warband's miniatures are a different color, so there's no need for paint. Here's a photo of my very real game in progress - NOT a staged shot of perfectly lined-up skeletons.You've got two double-sided boards that can be placed alongside one another in a bunch of configurations. Additionally, each board has several marked hexes for randomized objective tokens that change how the map plays. After a dozen or so games the arena still feels different each time around. Combat is an easy-to-grasp core surrounded by layers of mechanics that keep even straightforward brawls interesting. There are movement and activation limitations to consider, different stats for every fighter, character abilities that activate under specific circumstances, and ally adjacency bonuses. My favorite touch: An attacker who wins or draws on their attack roll gets to shove the defender back one tile, knocking them away from their target and potentially into the path of more trouble. Then there's the deck building. Objective cards grant glory points (you want these) when certain conditions are met. Upgrade cards buff individual characters for the duration of the game. Ploy cards create short term effects. The best card of all is Too Dumb To Die - not because of what it does, but because it's named Too Dumb To Die. That's when you jump back into another game. And get your face crushed by jerks with topknots. Because you're me. Okay, now you can stop being me. What was that about Age of Sigmar? Every miniature from Warhammer Underworlds: Shadespire can be used in the large-scale Warhammer fantasy wargame, Age of Sigmar. In fact, Shadespire warbands become unique units with their own special rules. This means that if you own the game you also have several visually distinct, powerful troops to build Age of Sigmar armies around. In the coming weeks I will choose my favorite Warhammer Underworlds miniatures and finally take my first steps into the world of wargaming. Collecting. Painting. Making army lists. Leaning over a battlefield and squinting at a tape measure. I have no idea what I'm doing and can't wait to make a fool of myself. Expect a progress update next month. Until recently, the last board game I touched was a dungeon crawler called HeroQuest, in the late 90s. Back then I was a young idiot. Now I am an older, far wiser idiot. Join me as I drop the controller and check out all the great board games I've been missing out on.